Two Life Changing Powerhouses, Life Changes Network and What if…? 360 Join Forces to Present a 5 Hour Life IMPROVment Workshop. Celebrity Guest Host, Kato Kaelin, and Top Improv Talent will Join Life Coaches to Give Attendees The Tools to Change Their Lives and Have a Blast Doing It! We not only work interactively with improvisation, we teach people how to use it in almost any situation in life, and to make the best choices possible in those improv moments. 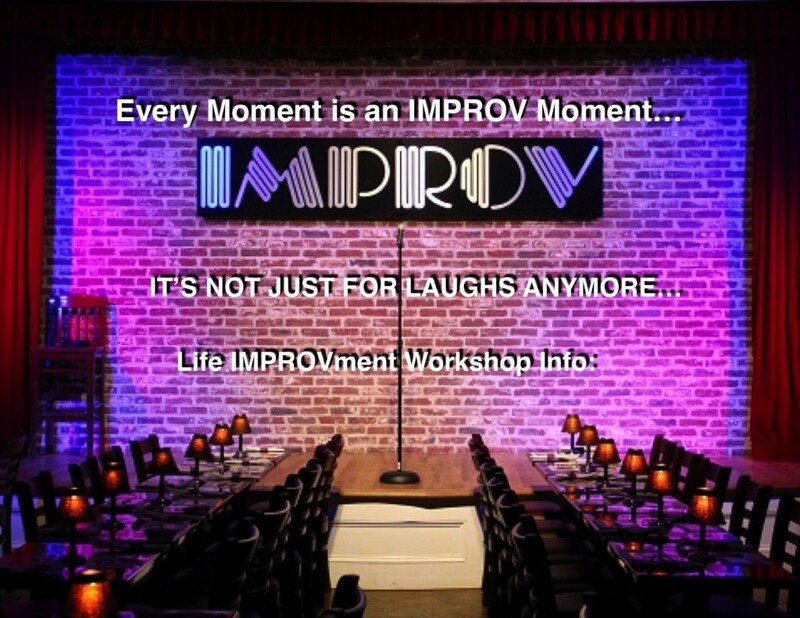 In this Life IMPROVment Workshop, improvisational tools/skills/performance and real life will come together for a powerful learning and life changing experience. The workshop will teach attendees how to apply the tools of improvisation to everyday life and decision making when confronted by life’s challenges. With Guest Host Kato Kaelin, Guest Comedian/Coach Craig Frazier, Guest Comedian Rick Overton, and Life IMPROVers Filippo Voltaggio, Mark Laisure and Dinah Leffert, and Matt Murrie and his team of “questioneers” from What if…? 360, this workshop is ground breaking in its approach to learning. The five-hour workshop and experience is in two parts, with an included lunch in-between. The first part will be The LIFE IMPROVment Workshop lead by life and business coaches from Life Changes and the other coach/comedians. It will include demonstrations and exercises in which attendees will all participate and interact personally with the coaches. After lunch all attendees will get to use their skills during the “What if…? 360” Los Angeles, Experience. It will be led by Matt Murrie, co-creator of What-if…? 360. He and his Team of “questioneers” will present new and compelling information and guide attendees into creative thinking processes and personalized action plans for each attendee as takeaways. Location: Hollywood IMPROV at 8162 Melrose Ave, Hollywood, California, 90046. Date and Time: Saturday, September 26th from 11am to 4pm. The $99 workshop fee includes lunch and parking and tickets can be purchased HERE Tickets purchased at the door are $129. Founded in 2007, Life Changes Network is an authentically entertaining transformational media, live event and wellness solutions company. The online destination of The Life Changes Show is hosted by Filippo Voltaggio and Mark Laisure, live every Monday night at 7 PM PST on the BBS Radio Network. When it comes to change, Life Changes is setting new trends and ushering in a new paradigm, with experts who have either changed their lives, changed the lives of others or are changing the world from moment to shared moment. Whatif…?360 is a community of doers, fueled by curiosity. We bust stale thought processes. We use active curiosity to co-author the future. By connecting people through question asking and collaboration we’re changing the way people build new ideas, businesses, and lives. Through live and virtual experiences we create collisions of people and thought. Whatif…?360 is the connection between ask, dream, and do.